At Wareable we're passionate golfers, and we'll embrace any wearable device that helps us knock shots off our handicaps. And luckily, we're spoiled for choice. While GPS watches have long been the staple of golf wearables, things are getting more sophisticated. With smartphone apps and smartwatches now capable of showing ranges at a glance, the focus is now shifting. Automatic shot detection, lay-up information, shot analysing and advanced insights into your game are the preserve of the new era of golf wearables. 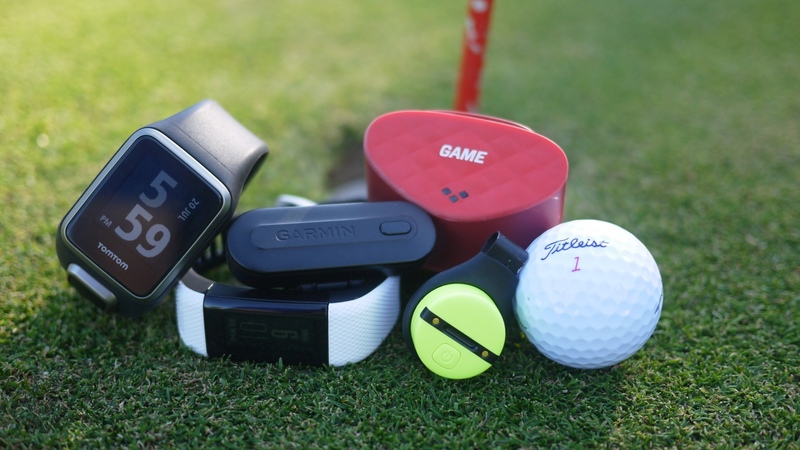 But few people can afford every single golf wearable out there – so as ever the purpose of our big test is simple: which wearable can make the biggest difference to your game? Read on to find out. Endorsed by Barack Obama and Graeme McDowell, Game Golf LIVE is a serious golf wearable. The belt clip is the wearable element, which acts as a receiver for sensors, which are screwed into the grip on top of your club. So what does it offer? Well, it builds of the most detailed pictures of your game of any product on the market. Not only are shots registered, you will build up a picture of your performance with each club. It will record average shot distances for each club. It will also offer average score data, a handicap, putts, longest drive, fairway accuracy, greens in regulation and scrambling percentage. The insights tab also shows you data for each club, and you can aggregate data for tee-shots and approaches to the pin, helping you to choose the right club in future. The live elements also make Game Golf more useful on the course, and you can fire up the app for live distances. What's more, Apple Watch users can use the companion app as a golf watch while out on the course. While there's no device that can parallel Game Golf LIVE for data richness, it suffers on usability. Forgetting to tap a shot isn't a disaster. Game Golf will recognise tee and fairway shots from the movement of your hips and you can tag the club you used later, which is surprisingly easy. Things get a bit shaky around the greens, where there isn't enough movement to detect shots, and when the pressure mounts around the green we rarely remembered to tap. The great irony is that you're more likely to forget to register your shots at the points of your game that require the greatest scrutiny. When you do get back, the data is fairly hard to implement. Short of learning your club distances – which is the biggest draw in our eyes – it's all well and good looking at the areas of your game that need to improve. But for us high handicappers, it's usually everything. A great alternative is Arccos Golf, which takes the hassle out of tapping by recognising shots automatically. It's still in testing, but it also suffers from missed shot recognition. The perfect shot tracker hasn't yet been born. If you're not willing to build Game Golf as part of your golfing life, then missed data will undermine its usefulness. You need to jump in with two feet, or not at all. Verdict: The easiest way to collect a lot of data about your game, but the hardest to make a genuine impression on your handicap. The TomTom Golfer 2 got a bit of savaging in our review, but after some teething trouble we're starting to iron out some of the major issues. It's kind of crucial to consider the TomTom Golfer 2 in two parts, firstly as a golf watch, and secondly as an automated scorer. As a golf watch it's outstanding, as good as anything on the market. Great course support, accurate distances and a fantastic array of lay-up distances and hazards make it an essential tool for golfers. Unfortunately, that's not enough these days. There's distance and hazard support built into an array of non-golf specific wearables including the Garmin Vivoactive HR, Microsoft Band 2 – which puts pressure on golf wearables to do more. Enter the TomTom Golfer 2's automatic shot detection. It simply registers and geotags a swing, discounting any others from the same location, counting your shots around the course. Unfortunately, things are far from perfect. Our first few rounds generated a lot of false positives, which could have been caused by our coat sleeve activating the manual shot input, which is supposed to be initiated by placing your hand across the screen. The idea of the feature is to ensure the Golfer 2 registers delicate chips and putts, but this is a major design floor. It ruined our first two rounds, but but after some extra testing, we managed to get recognised shots under control. However, things were still haphazard. It still missed most short game shots and still added plenty of false positives, usually when slipping our carry bag onto our shoulders. You can cancel a shot by quickly hitting the back button, but it's all a bit of a fudge, where you find yourself constantly adding or removing shots – a bit like Game Golf but without the added detail of specific club data. What's more, we had a few issues with rounds cutting out and struggled to re-find the course while standing on the fifth fairway. So what do you get from the app? Well, MySports is surprisingly well-built for golf, given that software has not always been TomTom's strong point. The data at the end will give you a pitch map of your drives, along with average distances, and it will aggregate data on courses you play regularly to build a picture of what you could achieve if you played your dream round. Pretty interesting stuff. In short, whether the TomTom Golfer 2 is over or under estimating your rounds, it undermines the data. Hopefully fine-tuned software updates will make this feature even better in the future. However, while it's being refined, the $249.99 price tag for the Golfer 2 is a little high to justify the range-finding features alone. Verdict: Has the makings of an exceptional golf watch, but too problematic to recommend right now. The first of two range-finders in our test, both are designed to offer insights into your swing like a personalised golf coach. Garmin TruSwing attaches to the shaft of your club and pairs to your smartphone, as well as Garmin golf watches such as the Approach S20 and Approach X40. Take a swing and you can access a full 3D recreation from the Garmin Connect smartphone app and/or get a purely data orientated view from your Garmin golf watch. It will capture club head speed, tempo, club path at impact, face to target angle, shaft lean at address, shaft lean at impact, shaft angle at address, shaft angle at impact and finally, dynamic loft. That's a hell of a lot of data, and serves to be a bit of a double-edged sword. If you know what you're looking for and how to correct it, the Garmin TruSwing is brilliant. Its position on the club is ideal, and it's lightweight enough not to interfere with your swing. While Zepp 2 can feel a little haphazard clipped onto the back of your glove, Garmin's consistency and accuracy impressed – if only we could make head or tail of the numbers. The results are presented in the dry and data heavy Garmin Conenct app which does nothing to indicate whether the numbers, angles and speeds you're looking at are good or bad. It doesn't try to coach you on any aspects either, and unlike Zepp there are no instructional videos or content to view. Essentially, if you're willing to take a device to your coach and get them to include the Garmin TruSwing in your lessons, then this is probably the best swing analyser you can buy. However, if you're just looking for some extra insight down at the range, then the Zepp 2, which is up next, is a far better bet. Verdict: If you're willing to get your coach on board then TruSwing comes highly recommended – but lack of coaching and guidance make it a tad baffling. Now on its second iteration, Zepp is top dog when it comes to swing analysing. The small unit, which clips onto the back of your glove and connects via Bluetooth to the Zepp smartphone or tablet app, captures a tonne of metrics about your swing. In terms of stats, Zepp Golf 2 is identical to its predecessor. Take a swing of a golf club and it will immediately spit out data on club speed, club plane, hand plane, temp, backswing angle, hip rotation and hand speed. In theory, all of these factors make the perfect golf shot. There are two key elements of the Zepp experience that make it the top dog for shot analysing in our book. Firstly, there's almost no lag time. By the time you've watched your ball land, details of the shot will be on your phone or tablet screen. It automatically loads, so you get an immediate feel of whether you're affecting the scores in a positive way. In comparison, Garmin also detailed numbers immediately on the wrist if you use a companion golf watch, but the app required a manual refresh to see the last shot, which is irritating. The second element that makes Zepp 2 our winner is the user friendly app. The jury is out on self teaching, and we would advise anyone to use Zepp or Garmin with a coach. However, Zepp's traffic light system for each metric and the associated videos and drills makes things easy to understand, and the videos can genuinely help your game. If you're really not going to pay for lessons, this is the next best thing. Verdict: The user friendly app and great coaching content makes Zepp 2 the swing king. There's something about the Garmin Approach X40 that's just really cool. The sleek band feels so much more natural than a big golf watch, yet you get all the same data and information. The design follows the Garmin Vivosmart HR+: a sleek plastic module in a thin rubber strap. There's heart rate underneath, just like the running version. Load one of the 40,000 available courses and you'll get full distances to the front, back and middle with an adaptable pin option, so you can set the position on the playing surface for an exact reading. However, we already said that specialist golf wearables need to do more than distances, and the Garmin has got that too. It also has autoshot detection, although its ambitions are less grand than TomTom. When a shot is detected it will prompt you silently to attribute a club, and then will ask you to manually enter your score at the end. It doesn't add it to your score and to be frank, we missed most of the prompts for club tagging. No great loss, as there's almost no provision for the data in Garmin Connect. That's not to say there isn't useful post-round data to peruse. Garmin Connect will log all your scores, breaking down per course, working out average scores per hole and your dream score based on historical best scores per hole. You can then look back over your rounds and see how you're improving. The Garmin Approach X40 is more than just a golf wearable. It has an open sport tracking mode which will track runs and cycles, mixing in heart rate data, which makes it genuinely as useful as any GPS running watch. The difference between the X40 and the Garmin Vivoactive HR is that while that's a powerful sports watch is golf range-finding added in, the Approach X40 is a powerful golf watch that works for general fitness and wellbeing too. There are some other decent golf features. Hitting the button will open a menu where you can access hazards, lay-ups, a distance to ball tracker, which is great for those booming drives. Add in smartwatch style notifications such as call details, WhatsApp messages and texts, 24/7 activity tracking including resting heart rate and the Garmin Approach X40 is probably the best golf wearable you can buy today, all in a diminutive band. Verdict: Sleek, multisport friendly and powerful on the course with adequate post-round data, the Garmin Approach X40 is a golfing powerhouse.